This first book in a series of three is a true look at life in one of France's most celebrated provinces. A Year in Provence is the story of author Peter Mayle's time living in the Lubéron. The book is written in a fictional style giving it an easy-read feeling. One of the most splendid aspects of the novel is the way in which each chapter represents a month. Following the calendar year, the story begins at New Years and concludes with the December holidays. 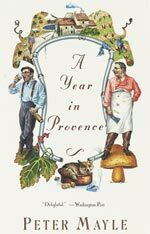 A national bestseller, this book is the perfect instrument for those looking to escape into a world of Provençal sanctity. "Get a glass of marc, lean back in your most comfortable chair, and spend a delicious year in Provence"
"Engaging, funny and richly appreciative"
"I really loved this book!"